The Diva Ladies Latin Dance Shoe is a stunning NEW addition to our Ladies Latin Dance range at Duo Dance London. It was introduced in May 2017 at Blackpool where it received glowing reviews. The Diva features a 3″ heel and is available in Silver Snakeskin or Dark Tan Satin. 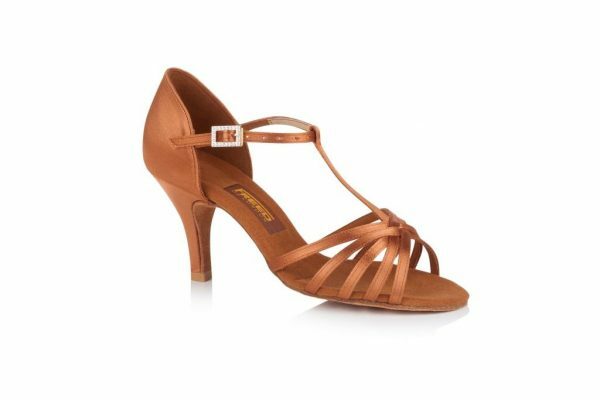 It is a perfect shoe for both the Professional and social dancer and is suitable for all styles of Latin dance including Salsa and Bachata. It is also popular at Duo Dance as a fabulous evening shoe. The Freed Diva Latin dance shoe is available in Dark Tan Satin or Silver Snakeskin. It features a 5 strip crossover vamp, t-bar for enhanced support to the foot and a diamante buckle. For added elegance, the shoe comes with a 3″ Straight heel enhancing the line of the leg and foot. The shoe is available in UK Sizes 2 – 8 including half sizes and comes in a regular fitting.